Welcome Our SharePoint Stack Exchange Valued Contributors. We would like to share with you the Most Active Contributors Report over the last month! Most Close Votes Review Award. Most First Post Review Award. Most Late Answer Review Award. Most Low-Quality Posts Review Award. Most Suggested Edit Review Award. 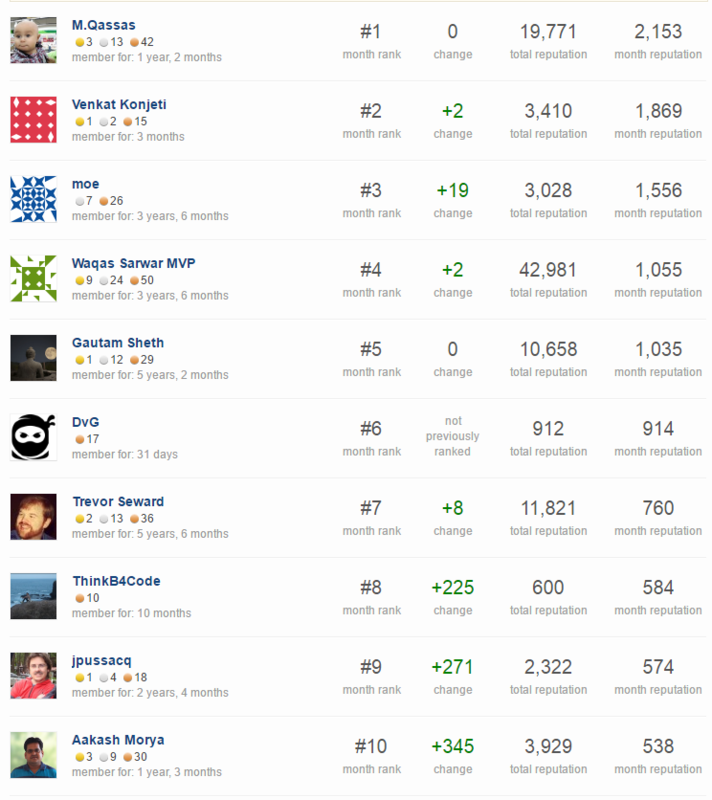 1st Top Contributors summary list. Answer Owner: Danny '365CSI' Engelman. How to create Star Rating column in list programmatically using CSOM? M.Qassas Great Job, Please Keep up your valuable contributions! Aashirya Great Job, Please Keep up your valuable contributions! hoffie4 Great Job, Please Keep up your valuable contributions! P S Great Job, Please Keep up your valuable contributions! CA Great Question, Please Keep up your valuable contributions! Danny '365CSI' Engelman Great Answer, Please Keep up your valuable contributions! Please join me in thanking all contributors for volunteering, We fully appreciate all the great contributions of SE members. Please keep your valuable contributing! P.S. : This report will be published Monthly / Quarterly / Yearly. Please don't hesitate to share your valuable feedback & precious suggestion! Browse other questions tagged discussion most-active-contributors monthly .